At the southern foot of the Wuzhou Mountains, deep within the Shi Li River Valley, the Yungang Grottoes stretch for over a kilometre and are etched indelibly into the rock-face. 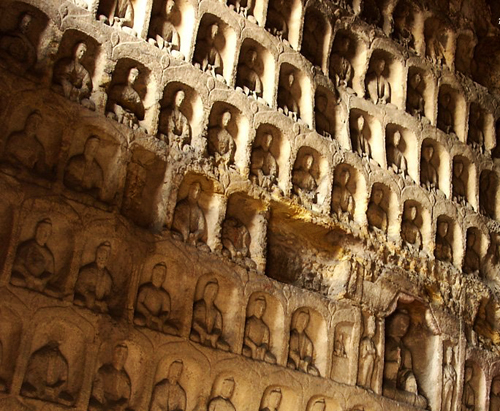 Just 16 kilometres west of Datong City, this group of 53 caves, 252 grottoes, and over 51,000 statues and statuettes have inspired visitors from all religious backgrounds for centuries. They were carved sometime between 453 and 525 AD, during the Northern Wei Dynasty (386-534 AD), and are categorised as one of the “Four Grand Groups of Grottoes” in China. The grottoes combine features from traditional Chinese art with those from foreign art styles, such as Greek and Indian, while the statues themselves range in height from 2 centimetres (0.7 in.) to 17 metres (56 ft.). So if you thought you were short, imagine being a thimble-sized statue next to one the size of an oak tree! Unsurprisingly the grottoes were listed by UNESCO as a World Heritage Site in 2001 and are currently divided into three major groups open to the public: the east section (caves 1-4); the central section (caves 5-13); and the west section (caves 14-53). Cave No. 6 is the largest, with a height of about 20 metres (65 ft.), but it is Cave No. 5 that contains the exemplary 17-metre-tall statue of Buddha. Unfortunately, over a period of more than 1,500 years, many of the statues have been damaged by war, pollution, and natural disasters, so parts of the complex are periodically shut down for maintenance. After all, at the grand old age of 1,500, they certainly deserve a little face lift every now and then! The construction of the grottoes can be split into three time periods: the Early Period (460-465 AD); the Middle Period (c. 471-494); and the Late Period (494-525). Those constructed in the Early Period are considered the most magnificent and contain the five main caves masterminded by the revered monk Tan Yao (caves 16-20). These particular caves are between 13 to 15 metres in height and are generally U-shaped with an arched roof, imitating the thatched sheds that were prolific in ancient India. Each cave has a door and a window, while the main part of the cave is taken up with the central statue and the walls are bedecked with carvings of thousands of smaller Buddhist statuettes. Just imagine all of those tiny eyes staring down at you! Throughout the Middle Period, the artistic style became more traditionally Chinese and the caves themselves reflect the hall arrangement that was popularised during the Han Dynasty (206 BC–220 AD). By the Late Period, the caves and statues had become much smaller in size and simpler in style, giving them a certain stately elegance. Perhaps they’d come to the realisation that, when it comes to spiritual enlightenment, size doesn’t matter! 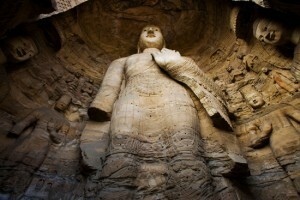 The history of the Yungang Grottoes is inextricably tied with that of the Northern Wei Dynasty. After the fall of the Jin Dynasty (265-420), a Turkic nomadic tribe known as the Tuoba clan took control of northern China and established their own dynasty. With the exception of Emperor Taiwu, the Tuoba clan were devout Buddhists, predominantly for political reasons as the religion helped them maintain control of their territory. Sometime between 398 and 494, Emperor Xiaowen established Pingcheng (modern-day Datong) as their capital and it would remain this way until 523, when Pingcheng would be abandoned due to warfare. Originally the emperor only commissioned five caves, to be built by Tan Yao and to depict the first five Wei emperors in Buddhist forms or as Buddha. These are now known as caves number 16 to 20 and were completed in 465 AD. From 471 to 494 the second phase of construction began and it is thought that caves 5 through 13 were built during this time. All of these grottoes were built under imperial patronage, but that unfortunately ended when the Wei court abandoned Pingcheng and moved their capital to Luoyang. In short, like water in the surrounding sands, the money dried up! All of the caves built after 494 are thought to have been financed privately, which may explain why they’re so small! During the Liao Dynasty (907-1125), wooden structures were built in front of the grottoes in an attempt to shield them from weather damage and incorporate them into temples. These were known as the Ten Famous Temples but were tragically destroyed due to warfare in 1122. The stunning wooden temples that can be found in front of caves 5, 6, and 7 were built for a similar purpose during the Qing Dynasty (1644-1912) but appear to have survived intact. From the 1950s onwards, numerous restorations and preservation projects have been implemented to protect the grottoes from further damage. 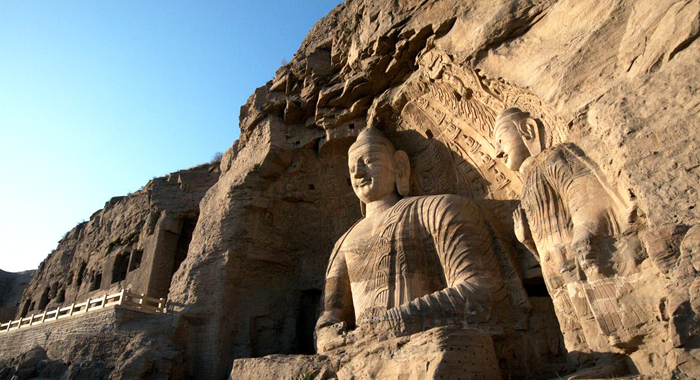 The Yungang Grottoes is one of the many wonderful stops on our Cultural Tour in Shanxi.